The EPA Great Lakes 2008 Earth Day Challenge is underway with about 100 projects in hundreds of communities across eight states including two events in Milwaukee, Wisconsin. 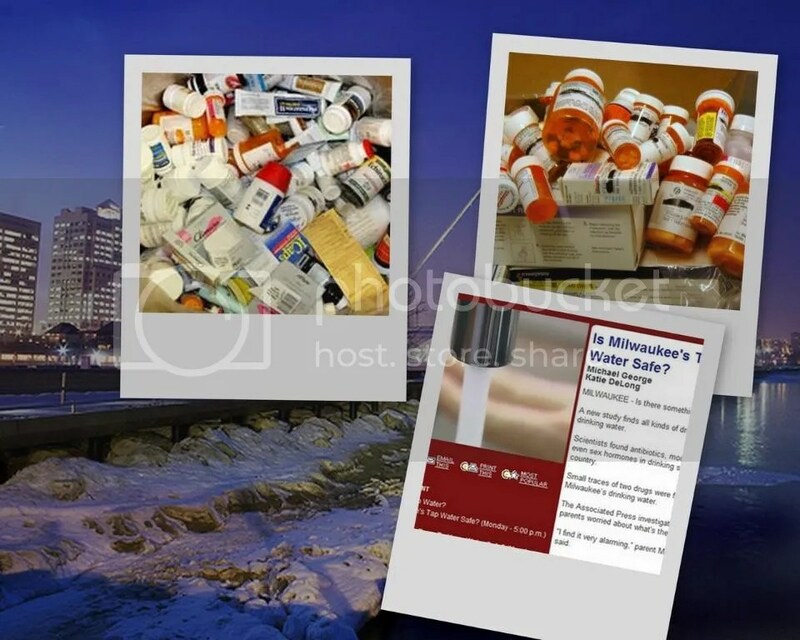 The Milwaukee Metropolitan Sewerage District (MMSD) is expanding its third annual Medicine Collection Day to include four counties. Named A prescription for clean water and safe kids, the pharmaceutical collections will be held on April 19 in Milwaukee, Racine, Ozaukee, and Washington counties. 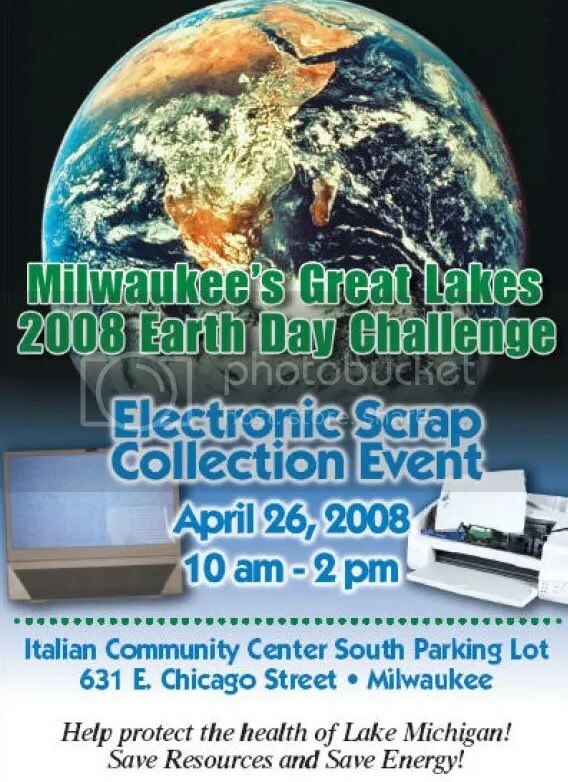 Meanwhile – the city of Milwaukee is hosting an electronic waste collection for its residents on Saturday, April 26, 2008 from 10 a.m. to 2 p.m. The e-Waste collection will be held in a parking lot just south of Italian Community Center, 631 E. Chicago St., Milwaukee. City of Milwaukee residents are invited to bring their unwanted televisions and computer equipment to this event to get them recycled. Material will be recycled at no charge to residents of Milwaukee. Officials added the event is not for business waste – just residents. The Earth Healing Initiative has put our local interfaith liaison in touch with Milwaukee officials. The MMSD has distributed nearly 200,000 postcards promoting the event that has been widely publicized by area media. The Earth Healing Initiative offered to help distribute the final 5,000 cards to interfaith contacts in the Milwaukee area. 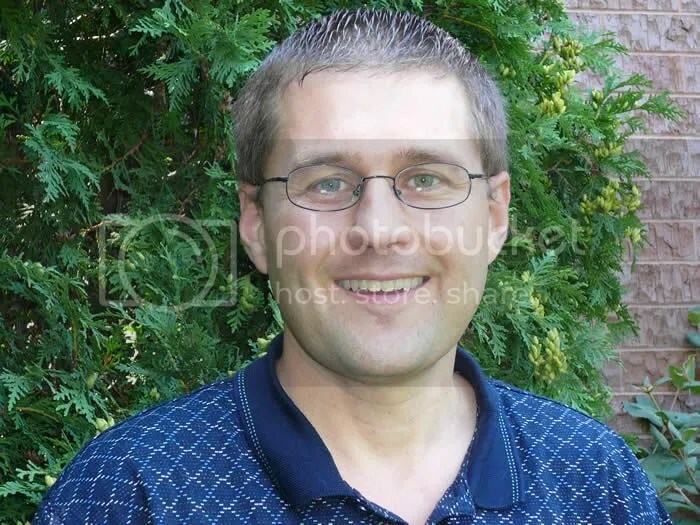 The MMSDs Steve Jacquart said the recent Associated Press investigation on drinking water helped create a lot of public interest in the issue. Jacquart added that this event will be the districts first truly regional Medicine Collection Day to help protect Lake Michigan, prevent childhood poisonings, and reduce substance abuse. The Milwaukee events are among about 100 projects involving hundreds of communities across eight states around the Great Lakes basin that are participating in an Earth Day 2008 challenge from the U.S. Environmental Protection Agency. 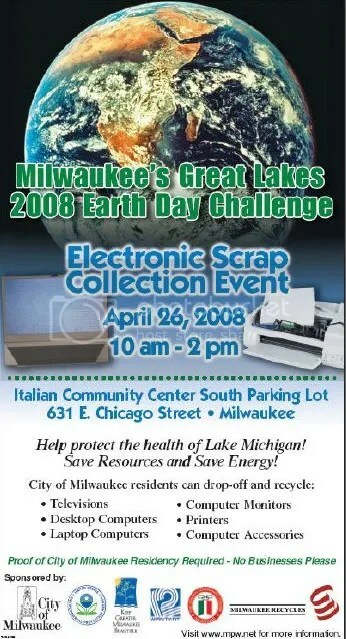 The goal of the EPA Great Lakes 2008 Earth Day Challenge is collecting and recycling one million pounds of electronics (e-Waste) and the collection of one million pills for proper disposal. The Earth Healing Initiative is assisting by offering interfaith liaisons to volunteer and encouraging members of local churches and temples to participate in the Earth Day related events in their area. The Earth Healing Initiative is also offering media services like this video. 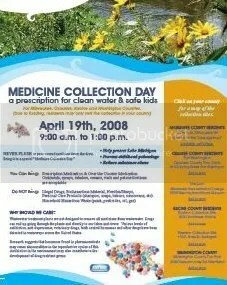 Details: This year’s 3rd annual Medicine Collection Day (A prescription for clean water & safe kids) on April 19th will collect and safely dispose of medicines in Milwaukee, Racine, Ozaukee, and Washington counties. This will be our first truly regional Medicine Collection Day to help protect Lake Michigan, prevent childhood poisonings, and reduce substance abuse. Milorganite – How do we make this stuff? 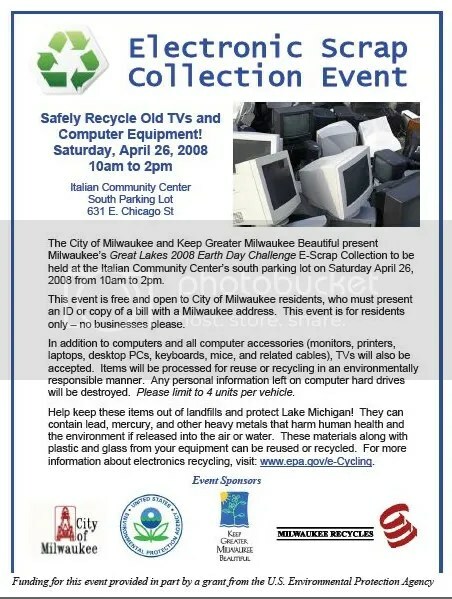 City of Milwaukee residents are invited to bring their unwanted televisions and computer equipment to this event to get them recycled. Material will be recycled at no charge to residents of Milwaukee. No businesses please. This entry was posted in ABC News, Abenaki, acid, acid mine, acid mine drainage, air, Akime, Akimel, Alabama-Coushatta, Aleut, Alton, American Indian, Ann Arbor, Apache, Apalachee, Appleton, Arapaho, Arikara, Arkansas, Art Neskahi, Assiniboin, Aurora Borealis, Bahai, Bannock, Bay City, Beecher, Bellwood, Benton Harbor, Biblical, Bishop, Blackfoot, Blaine, Bless, blessing, Bloomfield Hills, Bolingbrook, Brillion, Brockport, broken, Brooklyn Park, Buffalo, Cable News Network, Caddo, Canarsee, Carol Stream, Catawba, Cayuga, Cayuse, CBS, CBS News, cell phones, ceremony, Channahon, Cherokee, Cheyenne, Chicago, Chickasaw, Chilton, Chinook, Chippewa, Choctaw, Christian, church, Cleveland, climate, climate change, CNN, Coeur d'Alene, College of Menominee Nation, Columbia City, Colville, Comanche, communities, Community, computers, conference, Cortez, Cortez Journal, Crandon, Cree, cross, Crow, crow creek, culture, Cuyahoga County, Dakota, Dearborn Heights, Delaware, Detroit, Detroit Free Press, Detroit News, Diné, diocese, disposal, drinking water, Duluth, e-waste, Eagan, eagle, Earth, earth day, Earth Day 2008, Earth Healing Initiative, Earth Keeper Initiative, Earth Keepers, East Lansing, ecology, ecumenical, Eden Prairie, EHI, ELCA, electronics, Elk Grove Village, Elmhurst, environment, environmental, EPA, Erie, Eskimo, Evangelical Lutheran Church of America, faith, faith traditions, faith-based, Farmington Hills, First Nations Peoples, Fort Wayne, Fox News, Fredonia, Gary, glacier, Glenview, global warming, God, Goodells, grain, Great Lakes, Great Lakes 2008 Earth Day Challenge, Great Sioux Nation, Green Bay, Gros, Grove City, Haida, Hammond, Harbor Springs, Harlan McKosato, heritage, HHW, Hidatsa, Hoopa, Hopi, household hazardous waste, Huron, ice caps, Illinois, incinerator, Indian, Indiana, indigenous, Indigenous Issues, Indigenous peoples, interfaith, intolerance, Inuit, Iroquois, Islam, Islamic, isle, Jesus, Jewish, Joliet, justice, Kalispel, Kansa, Kaw, KBIC, Kent, Keweenaw Bay Indian Community, Kickapoo, Kiowa, Klallam, Klamath, Knox, Kootenai, Kwakiutl, l O'Odham, lake, Lake Erie, Lake Huron, Lake Michigan, Lake Superior, Lakota, Lakota Sioux, Lancaster, landfill, landfills, Lansing, LaPorte, Lockport, Lombard, Lord, love, Lumbee, Lutheran, Lutheran Campus Ministry, Lutheran School of Theology Chicago, Madison, Mahican, Maidu, Makah, Malecite, Mandan, Manhattan, Manitowoc, Maple Grove, Maricopa, Marquette, Mdewakanton, media, medical care, Medicine Cabinet Clean Out Day, medicines, melting, Mendota, Menominee, Menominee Indian Tribe of Wisconsin, Miami, Michigan, Micmac, Midland, Milwaukee, Milwaukee Journal, Milwaukee Sentinel, Minnesota, Mission Indians, Modoc, Mohave, Mohawk, Mohegan, Monroe, Montagnais, Mount Prospect, multicultural, Munising, Muskogee Creek, Muslim, mutation, Narragansett, Naskapi, Natchez, national public radio, national talk show, Native America Calling, Native American, Native American Theology, Native Plants, nature, Navajo, Navajo Times, NBC, NBC News, New Holstein, New Mexico, New Ulm, New York, New York City, news, newspaper, Nez Percé, NMU 2008 Indigenous Earth Day Summit, non-profit, Nootka, north, North American, North American Theology, Northbrook, northern, northern lights, Northern Michigan University, Northern Michigan University Native American Studies, NPR, O'Odham, Ohio, Ojibwa, Ojibwe, Okanogan, Oklahoma, Old Testament, Omaha, Oneida, Onondaga, Osage, Oshkosh, Oto, Ottawa, Paiute, Papago, Park Ridge, Parliament of the World's Religions, Patriotic, Pawnee, Pennacook, Pennsylvania, Penobscot, Pequot, Perrysburg, pharmaceutical waste, pharmaceuticals, pills, Pima, planet, Plover, pluralism, poisons, pollution, Pomo, Ponca, Pope, Potawatomi, Powhatan, prejudice, Presbyterian, proper disposal, Pueblo, Puyallup, Quapaw, Quechan, Racine, racism, recycle, religion, religions, respect, Rev Jon Magnuson, river, rivers, Rochester, Rockefeller Chapel, Roman Catholic, Rome, Romeoville, Rosebud, Royal Oaks, Rum River, Rushville, Sabaoth, Sacagawea, Saint Cloud, Saint Louis University, Salish, Sandusky, Santee, Sarsi, Sauk, Sault Ste Marie, Scholar, See Sac, Seminole, Seneca, Shakopee, Shawnee, Shorewood, Shoshone, Shuswap Sioux, Sioux, Sioux Nation, South Dakota, Southfield, Southwest Intertribal Voice, species, species extinction, Spirit Scholar, Spiritual Directors International, Spokan, Springfield, St Louis Park, St Paul, state of Michigan, stream, streams, sulfide, sulfide mine, Sulfide mining, sulfuric acid, Superior, Syracuse, television, Teton, theologian, Tillamook, Tillie Black Bear, Tlingit, Tobacco Nation, Tohono, Toledo, tradition, Traverse City, tree, trees, tribal, tribe, Tribune, truth, Tsimshian, Turtle Island, Turtle Island Project, Tuscarora, TV, Uncategorized, Union Theological Seminary, United Methodist Church, United Nations, United States, United States Environmental Protection Agency, Universalist Unitarian, University of Chicago, University of Indiana, University of Minnesota, unwanted, Upper Peninsula, USEAP, Ute, UU, Valparaiso, Valpraiso University, Ventre, Villa Park, volunteer, Wahkon, Wampanoag, Wappinger, Warren, Washo, water, Watersmeet, Waupaca, West Chicago, Western Lake Superior Sanitary District, Wheaton, Wichita, wild flowers, wild rice, wildlife, Winnebago, Wisconsin, WITW, Woodstock, world, world news, Wyandot, Yakima, Yamasee, Yankton Sioux, Yellow Dog Plains, Yokuts, Yuma, Yurok and tagged ABC News, Abenaki, acid, acid mine, acid mine drainage, Add new tag, air, Akime, Akimel, Alabama-Coushatta, Aleut, Alton, American Indian, Ann Arbor, Apache, Apalachee, Appleton, Arapaho, Arikara, Arkansas, Art Neskahi, Assiniboin, Aurora Borealis, Bahai, Bannock, Bay City, Beecher, Bellwood, Benton Harbor, Blackfoot, Blaine, Bless, Bloomfield Hills, Bolingbrook, Brillion, Brockport, broken, Brooklyn Park, Buffalo, Cable News Network, Caddo, Canarsee, Carol Stream, Catawba, Cayuga, Cayuse, CBS News, cell phones, ceremony, Channahon, Cherokee, Cheyenne, Chicago, Chickasaw, Chilton, Chinook, Chippewa, Christian, church, Cleveland, climate, climate change, CNN, Coeur d'Alene, College of Menominee Nation, Columbia City, Colville, Comanche, communities, computers, conference, Cortez, Cortez Journal, Crandon, Cree, cross, Crow, crow creek, culture, Cuyahoga County, Dakota, Dearborn Heights, Delaware, Detroit, Detroit Free Press, Detroit News, Diné, diocese, disposal, drinking water, Duluth, e-waste, Eagan, eagle, Earth, earth day, Earth Day 2008, Earth Healing Initiative, Earth Keeper Initiative, Earth Keepers, East Lansing, ecology, ecumenical, Eden Prairie, EHI, ELCA, electronics, Elk Grove Village, Elmhurst, environment, environmental, EPA, Erie, Eskimo, Evangelical Lutheran Church of America, faith, faith traditions, faith-based, Farmington Hills, First Nations Peoples, Fort Wayne, Fox News, Fredonia, Gary, glacier, Glenview, global warming, God, Goodells, grain, Great Lakes, Great Lakes 2008 Earth Day Challenge, Great Sioux Nation, Green Bay, Gros, Grove City, Haida, Hammond, Harbor Springs, Harlan McKosato, heritage, HHW, Hidatsa, Hoopa, Hopi, household hazardous waste, Huron, ice caps, Illinois, incinerator, Indian, Indiana, indigenous, Indigenous Issues, Indigenous peoples, interfaith, intolerance, Jesus, Jewish, Joliet, Kansa, KBIC, Kent, Keweenaw Bay Indian Community, Kickapoo, Kiowa, Klallam, Klamath, Knox, Kootenai, Kwakiutl, l O'Odham, lake, Lake Erie, Lake Huron, Lake Michigan, Lake Superior, Lakota, Lakota Sioux, Lancaster, landfill, landfills, Lansing, LaPorte, Lockport, Lombard, Lumbee, Lutheran, Lutheran Campus Ministry, Madison, Mahican, Maidu, Makah, Malecite, Mandan, Manhattan, Manitowoc, Maple Grove, Maricopa, Marquette, media, medical care, Medicine Cabinet Clean Out Day, medicines, melting, Menominee, Menominee Indian Tribe of Wisconsin, Michigan, Midland, Milwaukee, Milwaukee (two events), Milwaukee Journal, Milwaukee Sentinel, Minnesota, Mission Indians, Modoc, Mohave, Mohawk, Mohegan, Monroe, Montagnais, Mount Prospect, multicultural, mutation, Narragansett, Naskapi, Natchez, Native America Calling, Native American, Native American Theology, nature, Navajo, Navajo Times, NBC News, New Holstein, New Mexico, New Ulm, New York, New York City, news, newspaper, Nez Percé, NMU 2008 Indigenous Earth Day Summit, non-profit, Nootka, North American Theology, Northbrook, northern, Northern Michigan University, Northern Michigan University Native American Studies, O'Odham, Ohio, Ojibwa, Ojibwe, Okanogan, Oklahoma, Omaha, Oneida, Onondaga, Osage, Oshkosh, Oto, Ottawa, Paiute, Papago, Park Ridge, Patriotic, Pawnee, Pennacook, Pennsylvania, Penobscot, Pequot, Perrysburg, pharmaceutical waste, pharmaceuticals, pills, Pima, planet, Plover, pluralism, poisons, pollution, Pomo, Ponca, Pope, Potawatomi, Powhatan, prejudice, Presbyterian, proper disposal, Pueblo, Puyallup, Quapaw, Quechan, Racine, racism, recycle, religion, respect, Rev Jon Magnuson, river, rivers, Rochester, Roman Catholic, Rome, Romeoville, Rosebud, Royal Oaks, Rushville, Sabaoth, Sacagawea, Saint Cloud, Salish, Sandusky, Santee, Sarsi, Sauk, Sault Ste Marie, See Sac, Seminole, Seneca, Shakopee, Shawnee, Shorewood, Shoshone, Shuswap Sioux, Sioux, Sioux Nation, South Dakota, Southfield, Southwest Intertribal Voice, species, species extinction, Spokan, Springfield, St Louis Park, St Paul, state of Michigan, stream, sulfide, sulfide mine, Sulfide mining, sulfuric acid, Superior, Syracuse, Tillie Black Bear, Tobacco Nation, Toledo, tradition, Traverse City, tree, trees, tribal, tribe, Tribune, truth, Tsimshian, Turtle Island, Turtle Island Project, Tuscarora, TV, United Methodist Church, United Nations, United States, United States Environmental Protection Agency, Universalist Unitarian, University of Minnesota, unwanted, Upper Peninsula, USEAP, Ute, UU, Valparaiso, Ventre, Villa Park, volunteer, Wahkon, Wampanoag, Wappinger, Warren, Washo, water, Watersmeet, Waupaca, West Chicago, Western Lake Superior Sanitary District, Wheaton, Wichita, wild rice, wildlife, Winnebago, Wisconsin, WITW, Woodstock, world, world news, Wyandot, Yakima, Yamasee, Yankton Sioux, Yellow Dog Plains, Yokuts, Yuma, Yurok. Bookmark the permalink.